Looking for reasons to visit Banff and Lake Louise? Look no further! This promotional video sums up what Banff and Lake Louise are all about! Come enjoy Banff National Park with us – you won’t be disappointed! 2) Airport hand luggage: Make sure you don’t pack any sharp objects in your hand luggage if you are travelling to Canada by air. Most airport websites have information on what you should pack. London Heathrow Airport Security Information provides useful details. 3) Sunscreen: You will be at higher elevations in the Rocky Mountains which means you will be closer to the sun and it’s harmful rays. Lake Louise is at 1,536 m (5,039 feet); it is the highest permanent settlement in Canada (Banff is the highest town) so make sure you slip, slop, slap! (Slip on a shirt, slop on sunscreen and slap on a hat!). Areas like the tops of your ears and the underside of you chin and nose if you plan to go onto Athabasca glacier as the sun’s rays are reflected off the ice. 5) Clothing: Make sure you bring out a good breathable waterproof just in case. Alberta is the sunniest province in Canada, but west coast locations such as Vancouver are much wetter. Bring out a breathable fleece too – we have been known to have sleet and snow in the mountains in August. This is rare but does happen. Mountain weather can change suddenly so be prepared. The weather is cooler on the mountain tops. Swim gear is recommended too as some hotels have pools and there are hot springs to soak in! 6) Water: A light weight water bottle is a must as you need to get in the habit of continually sipping from a water bottle. The higher altitude means you will become dehydrated sooner and if you don’t drink plenty of water, you may find you develop signs of dehydration such as a head ache. Avoid excessive alcohol and products with caffeine in them as these can cause a ‘diuretic’ (water loss) effect speeding up dehydration. Bringing out a bottle and refilling it each time is a much more friendly to the environment than purchasing plactic bottles as these inevitable end up in landfills. You can drink the tap water here and most water sources come from glaciers so it tastes great too. 7) Footwear: If you intend to hike, make sure you have some sturdy waterproof boots as the trails can be very rocky. If you don’t intend to hike, there are plenty of walking trails which don’t require boots and suitable footwear such as trainers would suffice. High heels are only suitable in the cities so leave those at home! 8) Backpack: Bring out a backpack with a breathable mesh as it is more comfortable in warmer temperatures when hiking. 9) Knowledge: One of the main attractions in the Canadian Rockies is the wildlife. As the name indicates, these animals are “wild” so give them plenty of room. An animal as small as an innocent ground squirrel can give you a nasty bite. In the National and Provincial parks there are large fines if you feed the wildlife as you can do the animal more harm than good. Know what to do if you have a bear encounter and be prepared for a much rarer cougar (or mountain lion) encounter. These can happen quite close to most Rocky Mountain townsites. Visit the Parks Canada guide to safety and conservation and contact the local information office before you head out into the local area or back country for bear sightings. If there is a bear in an area, avoid that area. 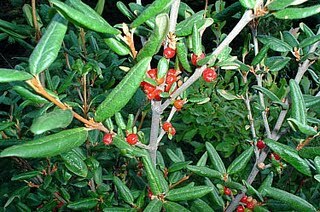 During the summer months in the Canadian Rockies, the bears love to feast on the buffalo berry bush. The berries are bright red (but can also be bright orange). Know what these plants look like and if you are in an area with a lot of these bushes, make plenty of noise or turn around and leave the area altogether. 10) Preparation: Be prepared for everything. Health care is expensive here if you don’t have travel insurance with medical coverage. If you injury yourself in the back country, you may need to helicopter to fly out so insurance a must. 11) Camera: Have plenty of memory if you bring out your digital camera and remember your charger! 12) Phone: If you are bringing your mobile phone from outside of Canada, be sure to contact your telecommunications provider and ask to have the “international roaming” function turned on. Check the rates before your leave as using your phone in Canada can be costly. 13) Travel adapter: If you intend to bring out any electronic equipment remember to bring out a travel adapter. Purchase this in your country of origin as buying one in Canada may be hard to find to fit your plug. 14) Credit card: Credit cards are accepted everywhere and usually there are no minimums. Make sure you contact your credit card provider before you leave so they don’t treat Canadian transactions as suspicious and block your card. Remember your pin to your credit card so you can withdrawl money although you will be charged for a cash advance by your credit card provider and for a foreign withdrawl. Ask your bank if you can use your card to withdrawl money overseas – this is usually the most economical way to pull out Canadian funds. Travellers cheques are not so common here – cash is king! 15) Itinerary: If you have had your holiday put together by a Rocky Mountain tour operator, keep your itinerary in your carry-on luggage and keep the company’s toll-free or freephone number in your wallet in case you need to call. This also provides peace of mind and support if you need it. Hopefully these steps should help you plan your Rocky Mountain Summer Holiday. A bear warning has been placed for the Larch Islands, in the Canmore Nordic Centre Provincial Park. Bears, including one grizzly bear with an ear tag transmitter, are travelling to and from the islands to feed on ripe berries in the area. The ripe berries will continue to attract bears to the area. Bears could be encountered anytime, anywhere. All users need to make plenty of noise, and be observant. Be especially vigilant when travelling through areas where ripe berries are present. Dogs, as always, must be kept on leash. Carrying bear spray is strongly recommended, not only here, but any time you venture out in to bear habitat. Using trails with good, open sight lines is preferred. Conservation Officers will be monitoring daily. The warning will remain in place until further notice. Guests can experience Canada’s most exciting three-hour rail journey – the Whistler Mountaineer – a breathtaking train trip between North Vancouver and Whistler in Glacier Dome, for *FREE for a limited time. 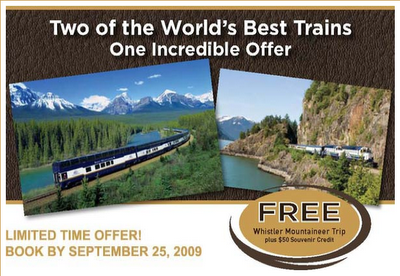 Until September 25, 2009, book a Rocky Mountaineer two-day rail journey or holiday package, and receive a round-trip journey onboard the Whistler Mountaineer train for FREE, plus a $50 Rocky Mountaineer souvenir credit. This promotion ends on September 25 2009 so hurry! 2. Applicable to departures through the end of the 2009 Rocky Mountaineer season (October 11); note: the 2009 Whistler Mountaineer season ends October 6. 3. Offers are capacity controlled and may be modified, withdrawn or amended without prior notice. 5. Not available in conjunction with any other offer. 6. Qualifying rail journey can be purchased in either class of service. 7. Free offers must be used as part of the package or 2-day rail journey and cannot be deferred to another date or refunded. 8. Free offers must be requested at the time of booking. Offers will not be automatically allocated or retrospectively added. 9. Not available for group tour block bookings. 10. RedLeaf bookings will receive Coast Classic experience, GoldLeaf or Escorted Tour bookings will receive Glacier Dome experience. 11. Onboard souvenir credit has no cash value and must be used on the Rocky Mountaineer 2 day experience. More information can be found on our Rocky Mountaineer Holidays page. WHISTLER, BC August 6, 2009 – Whistler is readying itself to welcome the world with Kokanee Crankworx, the world’s largest freeride mountain bike festival, kicking off in just two days. Now in its sixth year, the event has grown from a grassroots celebration of gravity-fueled mountain biking, to a festival spanning nine days; drawing over 300 of the world’s best mountain bike athletes, over 150 accredited media and tens of thousands of spectators. Kokanee Crankworx’s free events, coupled with incredible deals on accommodation and dining in Whistler, bode well for a successful festival, and are expected to drive attendance as visitors seek out high-value experiences this summer..
Kokanee Crankworx will feature free, world-class mountain bike competitions; the Deraylor Music Festival featuring artists like K-OS; and the inaugural Saint Deep Summer Photo Challenge slideshow event at the Fairmont Chateau Whistler. The Crankworx calendar features mountain bike events nearly every day, a Bike Expo and Demo Zone snaking through the village, and athletic spectacles around every bend including the mind-blowing technique of trials gurus Ryan Leech and the Baia Brothers. For those who can’t be in Whistler, organizers are anticipating a worldwide, online audience of over 150,000 through live feeds of the following events in the Pacific Time Zone: Air Downhill, August 13, 5:30-7:30pm; the VW Trick Showdown, August 14, 6-9pm; and the iconic Monster Energy Slopestyle, August 15, 5:30-7:30pm on Go211.com and www.crankworx.com. While Whistler Blackcomb has been affected by two wildfires on Blackcomb Mountain in the last week, they have been quickly managed thanks to the Ministry of Forests and Range, the Whistler Fire Department and Whistler Blackcomb staff. At this point there is no concern that wildfires could impact Kokanee Crankworx as these occurrences have been in isolated areas high on Blackcomb Mountain. Extreme caution is being exercised with on-mountain operations, and sightseeing and hiking continues on Whistler and Blackcomb Mountains. Whistler and Blackcomb Mountain operations continued yesterday, offering sightseeing, hiking and mountain biking via seven chairlifts, including the PEAK 2 PEAK Gondola. Fire crews remained on site on Blackcomb yesterday and remain vigilant given the high temperatures and potential for changing weather patterns. Further details regarding the status of two Blackcomb fires will be distributed by the Resort Municipality of Whistler, in conjunction with the Ministry of Forests & Range following morning briefings. Blackcomb Mountain operations include access for uploading and downloading via the Wizard Express and Solar Coaster chairs from the Blackcomb base, sightseeing around the Blackcomb PEAK 2 PEAK terminal and Rendezvous, as well as the Alpine Walk hiking trail located on the southwest side of the mountain. Rendezvous and Christine’s restaurants will also be operational. Access to the Overlord trail and all other Blackcomb trails are restricted. As well, the Crystal Ridge and Ruby Bowl fires are still active and entry into these areas is strictly prohibited. Whistler Mountain is open, including the PEAK 2 PEAK Gondola, for sightseeing, hiking and mountain biking, with some restrictions to the high alpine hiking trails such as the High Note and Singing Pass trails. Access is via the Whistler Village Gondola or the Fitzsimmons Express. For full details on Whistler Blackcomb operations, please visit us online at www.whistlerblackcomb.com/whatsopen (linked from the homepage) or call 1-800-766-0449.